Plot Summary: Lupin successfully steals a magic lamp that contains a female genie in it. He believes that the legends are true about gettting any wish he likes. However when the clock stroke 7 pm, Lupin finds himself in Singapore and discovered that it was already the next day. Confused in baffled in wondering what he was doing after 7 pm last night. Lupin attempts to solve the mystery of the magic lamp he found. Of course everytime it stikes 7 pm, Lupin's memory gets stolen. 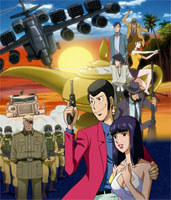 Which creates problems for Lupin if he doesn't even remenber what he is doing.